Management has ordered a weekly fruit box delivered to my office, and so on Tuesdays around 10am the office kitchen is usually filled with a happy buzz of conversation as my coworkers pick out a piece of fruit to snack on. This week the usual box arrived, but half of the office was out sick, on vacation, or traveling for an event, plus Tuesday was an official snow day (no work!). When I checked on Wednesday, the fruit box was still 3/4 full, and there were two pints of kumquats looking for a new home. I took one of the pints and started searching the interwebs for likely recipes. Anything gingerbread appeals to my Christmas sensibilities, so this one was bookmarked straight away. 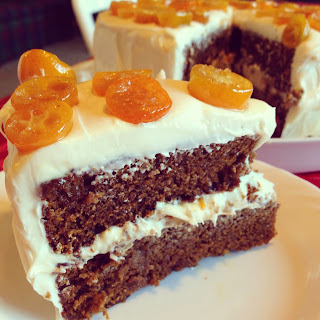 It was a little involved (holiday recipes almost always are, as a rule), but so worth it! Preheat oven to 350°F. Generously butter two 9” cake pans and dust with flour, knocking out excess. Bring coffee and molasses to a boil in a large saucepan and remove from heat. Whisk in baking soda, then cool to room temperature. Pour batter into pans (splitting amount 50/50 between the pans). Bake in middle of oven until a toothpick comes out with just a few moist crumbs adhering, about 30 minutes. Cool cake in pans on racks for 5 minutes. Turn out onto racks and cool completely. Bring first 5 ingredients to boil in heavy large skillet, stirring to dissolve sugar. Add vanilla extract. Add kumquats; reduce heat to medium and simmer until almost tender, stirring often, about 6 minutes. Using slotted spoon, transfer kumquats to plate. Boil syrup until reduced to 2/3 cup, stirring often, about 8 minutes. Cool syrup. Chop enough candied kumquats to measure 1/3 cup; mix in small bowl with 1 tablespoon kumquat syrup. Place 1 cake layer on platter. Spread 3/4 cup frosting over. 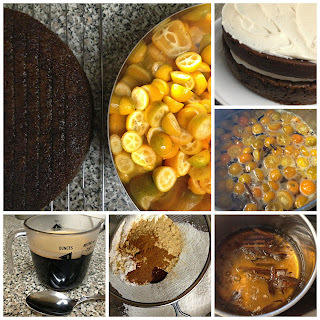 Dot with chopped-kumquat mixture. Top with second cake layer. Spread remaining frosting over top and sides of cake. 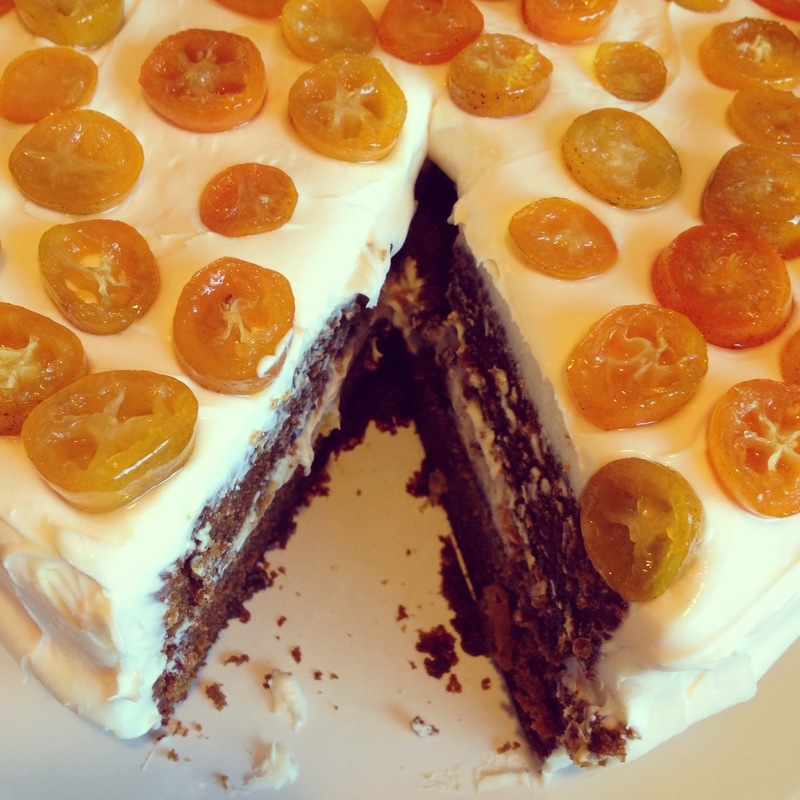 Arrange enough sliced kumquats in single layer atop cake just to cover. Chill 1 hour. 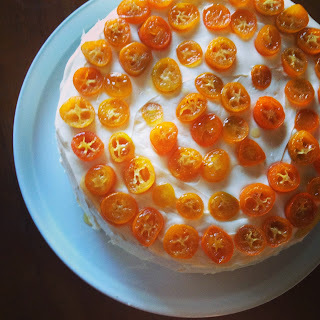 Drizzle some kumquat syrup over kumquats atop cake. Serve cake cold or at room temperature. This cake is unbelievably good at first bite. It looks impressive, so expectations are high... and it blows those out of the water. Like, dang. If I made it again I might cut down on the cream cheese frosting a little bit, but then again I'm not a frosting person. It's very rich, nicely spicy, and perfect with a cup of coffee. Or by itself. Straight from the fridge at midnight. And any other time. YUM. 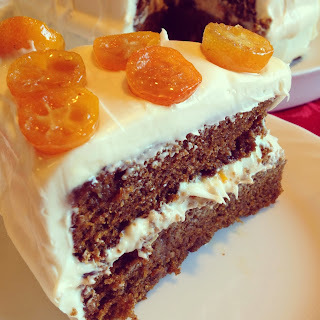 Recommended for: anyone looking for a cake with a kick of spice and citrus, a perfect holiday treat that will make the whole house smell like Christmas, and a deliciously addictive dessert to end a special meal. Interested in another food-related posts? Check out Beth Fish Reads' Weekend Cooking! Wow that looks amazing! I love kumquats and I love gingerbread. *And* this was a Smitten Kitchen recipe. What could go wrong?? I too am not much of frosting person,so I might cut back a little. And I was just wondering what to serve for dessert at my New Year's Eve dinner. I may have just found it. That looks festive and delicious! holy crap that cake LOOKS SO AMAZING. my favorite thing this season is the gingerbread loaf from starbucks with candied ginger and cream cheese icing. This looks like that times 200. Also intrigued by kumquats? i have never had them ever! YUM! You had me at candied kumquats.